Editor's note: Over the next few weeks, we at IDA will be introducing our community to the films that have been honored by the Academy of Motion Picture Arts and Sciences with an Oscar® nomination in the documentary category. You can see 4.1 Miles on Saturday, February 25 at 7:50 p.m. at the Writers Guild of America Theater as part of IDA's DocuDay. Daphne Matziaraki's 4.1 Miles, completed as a thesis project for the Documentary Program at UC Berkeley's School of Journalism, premiered last year as part of The New York Times' Op-Docs short film series; it feels as stirring and newsworthy as anything on the Paper of Record's front page. 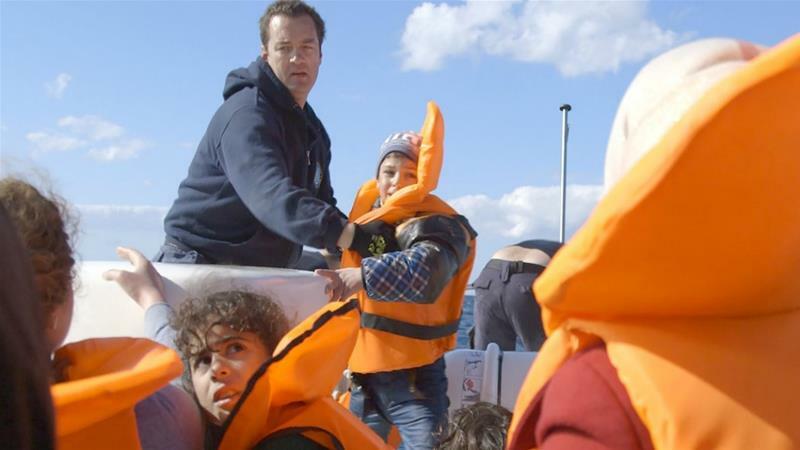 The film is an embedded report from a Coast Guard ship off the Greek island of Lesbos, whose captain has been pressed into service to save thousands of refugees (who use flimsy boats to cross the 4.1 miles from the Turkish coast) from drowning in the Mediterranean Sea. We reached Matziaraki via e-mail to discuss the ongoing refugee crisis, the work of documentary journalism, and the line between participant and observer. You worked as a news reporter and foreign correspondent before enrolling at Berkeley. What made you transition from journalism to documentary? After finishing my first Master's degree in International Relations, I worked in Kenya for a few years. This was when I realized I wanted to tell important stories,and the way I wanted to do this was through documentary. I always loved watching documentaries. I found documentary to be an exceptional storytelling vehicle. It combines the truth, structure, art and imagination. And when these are used well together, the story can be immensely impactful. I got into journalism almost by accident, as the first documentary project I started working on fell through. Working as a journalist was fascinating and really shaped me to be able to understand, analyze and tell stories in a way that the audience wants to hear. But journalism is a completely different thing from documentary filmmaking. Filmmaking is a very difficult art. So, while I was working as a journalist in Greece, Europe, Africa and the US, documentary was always in the back of my mind. I always knew I was going to do it. When I moved to Berkeley, I immediately applied to the best documentary film program in the world (in my opinion): the UC Berkeley Graduate School of Journalism, where I learned the art from legendary filmmakers like Jon Else, Orlando Bagwell, Spencer Nakasako and Dan Krauss. How did you decide to tell this story, focusing on the island of Lesbos and this particular boat? While I was still in graduate school for documentary filmmaking, the refugee crisis was all over the news. Greece was in the epicenter of it all. I am originally from Greece, so naturally I was very drawn to the coverage. I was reading everything that was out there, and a lot of the stories were great. However, I noticed that despite the amount of coverage, I couldn't help but still feel very distanced and detached from the story. The gap between our comfort zone and this reality at the other end of the world really struck me. So I wanted to make a film that would really bring these two worlds together: The everyday world of a peaceful "normal" environment and this tragedy that has been taking place. The island of Lesbos has been the main destination for the smuggled boats that were packed with refugees. It's just 4.1 miles from the Turkish coast. Refugees from Syria and other conflict zones, trying to escape war, would be smuggled though Turkey and they would cross to Lesbos, their first EU entry point. Refugees would be forced to leave their homes and would have no safe way to do this, apart from paying smugglers tens of thousands of dollars. I was reading that smugglers in Turkey were packing these flimsy boats with more than 50 people per boat. These refugees were from countries not familiar with the sea. A lot of these people had possibly never seen the sea before. The smuggler assigns a driver and tells them that Greece is just straight ahead. In rough conditions, these boats would capsize or the cheap motors would just stop. As a result the refugee families with babies would be stranded in the middle of the sea. I was reading that a lot of people were drowning and the first responders was the Greek Coast guard. Being from Greece I knew that the Greek Coast Guard wasn't prepared to do this kind of work. Their work involved routine border patrol in the peaceful waters of the Aegean. These people don't even have CPR training. And their life on the small island was peaceful and very relaxed. Suddenly they were hit with the biggest refugee crisis since World War II. Naturally and symbolically, the boat of the GC is where these two worlds collide and become one under the most tragic circumstances. I felt that this angle, to tell the story from the point of view of a simple man who never thought that he would be involved in a situation of this kind, now has to lift the weight of the entire refugee crisis. He has no other option but to respond. The responsiveness and bravery that come out of the simple man, his understanding that the only thing these refugee families ask for is dignity to live, is what makes him a true hero of our times. How did you establish a sense of cinematic immediacy? Were you always the one holding the camera? I was always the one holding the camera. The rescues that you see in the film are all from one single day. This was the first day I was on the boat, and the footage really conveyed my own panic and horror. I found this footage extremely effective, more than the footage of all the other days, when naturally I was calmer and "shooting better and more beautifully." Also, holding the camera for very long observational shots and being patient, analyzing with my lens the feelings of the people of on the boat, really contributed to conveying the story as it exactly was. Can you tell me about what it was like to film in such chaotic life-and-death situations? How did you negotiate the boundary between participant and observer? Before I went to shoot the film, I had decided that I was going to stay impartial, and I would never get involved in a rescue situation. I had decided that my role was to film in the best and most accurate way the situation as it exactly were. This was a very big ethical dilemma for me. I knew I wasn't trained to help, and I needed to stay out of the crew's way. However, being on that boat the situation was completely different. Like I mentioned before, the crew isn't trained to do CPR and their boats are very small, their equipment is not geared to deal with an emergency of this kind. Every rescue was a chaotic, frantic scene. It was a fight with the waves, the wind and death. At this moment everyone is on the fine line between life and death. A situation like this changes everything. It changes instantly who we are and how we perceive life. And death. I decided to open the film with this exact scene. The captain pulls a baby from a rescued boat, up to the CG boat and tells me to put my camera down and hold the baby. At this moment I did put my camera down and held the baby. No second thought crossed my mind. I had to respond. And this happened over and over again. You made 4.1 Miles as your graduate thesis film. What were the benefits and drawbacks of making it as a student? 4.1 Miles was my first film. I had advice from legendary filmmakers. People who taught me everything I know about being a filmmaker. I had the time and space to do this without the pressures of real life outside school. I really don't see any drawbacks. Only benefits. I had all the support, time and space to do this in the best possible way. The film won a Student Academy Award as well as the IDA Student Award! Several of your fellow documentary nominees have also covered different aspects of the global refugee crisis, largely in an attempt to humanize those who might otherwise become a tragic abstraction. Why do you think this particular crisis has provoked so much visual reportage? It is the most important story of our times. The tragic war in Syria is one of the biggest horrors in human history. But the result of it, this enormous exodus of people, trying to reach safety with no help, is even more tragic. It's a remarkable historical moment that I think we as human beings will be very ashamed of in the years to come. How can the entire world let these people not only die in war, but if they manage to escape, let them die on the way to freedom? These are people like us who are only asking for dignity. And the entire world is turning its back to them. I'm extremely happy that filmmakers have decided to tell these stories. Behind them there are human beings with incredible stories. My film is a verite, completely visual approach to filmmaking. Because what is happening is very visual. For me, sometimes words are unnecessary. An image is much more powerful. If we can just see something developing, without someone spoonfeeding us information about it, it makes for much more powerful and real storytelling. Akiva Gottlieb is IDA's Communications Manager and Associate Editor of Documentary magazine.